Named after the river that separates England and Wales, the Severn River is the Capital River of the State of Maryland and was designated as a Maryland Scenic River in 1971. Unfortunately, this designation did not provide any special protection, and the Severn has been classified as an “impaired” body of water under the Clean Water Act. The Severn Riverkeeper Program is a fully staffed professional community based organization and is part of the National Waterkeepers Alliance. Headed by Fred Kelly, the first environmental attorney for the Chesapeake Bay Foundation, the SRK was founded by him in 2002. With over 35 years of experience as an environmental attorney, he serves as the Severn Riverkeeper. We pride ourselves on being an action, goal-oriented organization. With an expert staff and results-oriented mindset, we have accomplished much in the way of protection for the Severn. We currently maintain four key programs: watershed restoration, public outreach/education, advocacy, and water quality monitoring. In 2000 Maryland signed an agreement with surrounding states and the federal government to restore the Chesapeake Bay. The signatories formed the Chesapeake Bay Program to oversee this effort. In the photo to the right, the monitoring crew is shown reacting to the distinct, “rotten egg” smell of hydrogen sulfide. H2S is the bi-product of anaerobic metabolism, thus is only present in a dead zone where there is no dissolved oxygen. At a news conference in 2001, the head of the Bay Program acknowledged that the only way to stop pollution was to shift from the regional to the local, river-by-river, approach. 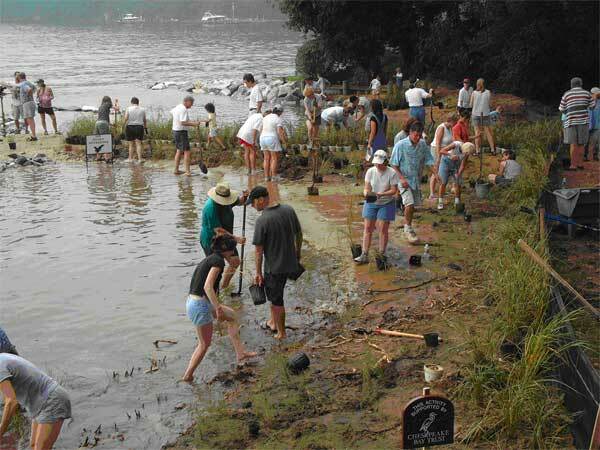 In June of 2002, we accepted this challenge and formed an organization to save the Severn. Lacking concrete data, we initiated a monitoring program to reveal the actual condition of the river. Unfortunately, we discovered extremely low dissolved oxygen levels and dead zones. Since then, we have provided this information to the Governor and his agency heads along with recommendations to improve water quality in the form of an annual SevernStat Report. These reports have become part of the Governor’s BayStat Program. In our 2007 SevernStat Report we recommended additional protection for living shorelines, and the Living Shoreline Protection Act of 2008 was passed. We also helped provide additional shoreline protection by convincing the head of the Critical Area Commission to increase the maximum penalty for violations from $500 to $10,000. In 2002 founding board member Dave Wallace, with Keith Underwood of Underwood Associates, installed an innovative stormwater control system at Howard’s Branch on the Severn River (pictured left). This system, called a Regenerative Stormwater Conveyance System (RSC), was particularly effective at stopping pollution and has been highly acclaimed by the scientific community. In 2008, a leading builder signaled the end of destructive development in Anne Arundel County by incorporating this system in the Preserve at Severn Run. In 2003 we created a prototype living shoreline at Drevar Park with the community of Epping Forest. In the process, we engaged over 100 volunteers including young children and educators. 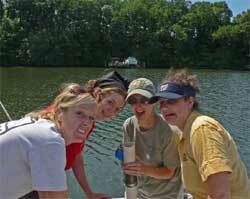 The teachers took the experience back to their classrooms to help instill environmental stewardship in their students. In 2008 we partnered with the Chesapeake Bay Foundation to focus on oyster restoration in the Severn. We hosted a forum to attract Oyster Gardeners where we highlighted the Severn as a particularly good, disease-free habitat. In October of 2008 a new oyster reef was created at the mouth of Aisquith Creek with rubble from the Bay Bridge and more than 3 million oyster spat (pictured at right). In addition to these activities, we participate annually in Project Clean Stream. For example, in 2006 dedicated volunteers restored the headwaters of Saltworks Creek by removing tons of trash including eight leaking oil tanks (photo at left). In 2007 we cleaned up the Jabez Branch, the last remaining natural spawning area for Eastern Brook Trout. 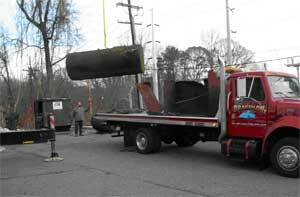 In 2008, we tackled the headwaters of Indian Creek, removing over 21 tons of trash and hundreds of old tires. All of these activities are fun and rewarding. Your efforts will help us make a difference in protecting and restoring the river. Together we can save the Severn!